If you have ever come across products from the Chinese manufacturer Redcircle they were probably copies of mechanical pencils from Rotring, but a little known fact is that Redring does not only copy Rotring pens, they also sell leads. There are of course standard graphite leads from Redcircle, but what I found more interesting was their pack of mixed colour leads, available in 0.5 mm and 0.7 mm. The first surprise is that the colours available for the different lead diameters are slighlty different. The main difference is that there is a red 0.5 mm lead, while there is only an orange 0.7 mm lead, the purple and blue 0.5 mm leads are also much more similar in colour than the purble and blue 0.7 mm leads. 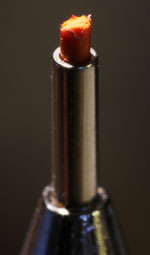 Both 0.5 mm and 0.7 mm leads are unusually hard for coloured leads. The hardness of the Redcircle leads is somewhere between traditional coloured leads and graphite / polymer leads. For people who are holding their pencils at a very low angle (like me) this might sound like an advantage as most coloured leads are very soft and will break easily. ((Generally I find the problem of breaking coloured leads so bad that I bought a Staedtler REG 925 85 05 Regulator. As you might know, the regulator allows you to set it in such a way that the lead is only advanced a tiny bit, very useful for avoiding lead breakage.)) In this case however the disadvantages that go hand in hand with this harder lead are just too annoying. 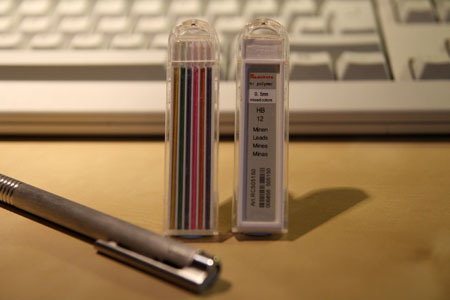 Compared to other coloured leads the colours are much less intense, they do not seem to “stick” to the paper, even if use more pressure when writing. This effect if worse for some colours (blue) and better for others (red). Generally this problem seems to be worse for the 0.7 mm leads. Many of the Redcircle colours are also quite grey once they are on paper and have an unpleasant look to it. I was surprised to see hard colour leads from a Chinese manufacturer as according to my experience Asian manufacturers and consumers seem to prefer softer leads. Unfortunately I was disappointed: These leads are much worse than most other coloured leads. You can find a review of the Staedtler REG 925 85 Regulator at Pens and Pencils. The containers look like copies of Uni -ish leads. I’ll know to avoid Redcircle is i ever see it. The coloured ones are really rather awful. I thought I give them a try as I haven’t found my perfect colour lead yet. At least they are not “unusably bad” 🙂 I might try their graphite leads next time I’m in China. 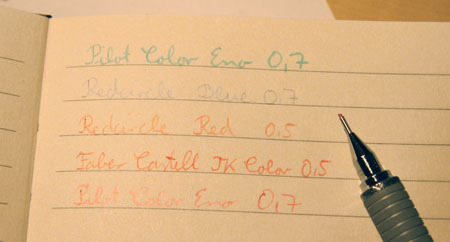 Do you know of any red colo(u)red lead refills that are rich in color? Sean, some are rich in colour, but they are usually either blue-ish, like the Pilot Color Eno, or orange-ish. I haven’t found the perfect red lead yet that I really like 🙁 The colour of the Faber-Castell TK-Color is nice, but it is a very soft lead. The uni Color is also quite nice.